As if Nintendo did not suffered enough already when Nintendo’s 3rd President, Hiroshi Yamauchi, passed away at age 85 due to reported complications of pneumonia in 2013. A dark cloud has once more set on top of Nintendo Land with the death of who was current President of Nintendo, Satoru Iwata. Iwata died at the young age of 55 due to a reported tumor in his bile duct. Reportedly, the tumor was discovered in June 2014 and was successfully removed. However, the cancer reappeared and took Iwata’s life on July 11th, 2015. I am in shock because it seems like yesterday when I was writing about how Iwata has been doing an exceptional job at keeping Nintendo’s name relevant in the industry. Nintendo as to this date has not released who will be Satoru Iwata’s successor. At the time, Nintendo is reportedly being managed Genyo Takeda (general manager of Nintendo’s integrated research division and Representative Director of Nintendo) and Shigeru Miyamoto (video game designer and producer) while awaiting the new President to be appointed. Iwata’s journey with Nintendo started as a collaborator through his gaming developing role in HAL Laboratory in 1980, a Japanese video game developer in Tokyo. Through exceptional work on developing the EarthBound and Kirby series titles, Iwata became President of Hal in 1993. During his time as President at HAL, he assisted Nintendo with the world famous titles of Pokémon and Super Smash Bros. In 2000, Iwata began working officially for Nintendo in the corporate division. If you have been paying attention to the dates, that means only 2 years after his start date he became President of Nintendo (and the first outside of the Yamauchi family). How IMPRESSIVE is that?! Pretty darn impressive if you ask me. During his reign as President, he birthed various Nintendo’s smashing hits like the Wii gaming console and the Nintendo DS handheld – the latter being the second-best selling video game console of all time following the PlayStation 2. Both systems (i.e., the Wii and DS) reinforced Nintendo’s relevance in the gaming world after the public not taking well the GameCube console (which I will never understand because it is actually one of my favorite). Also during his years at Nintendo, Iwata was involved in the Super Mario, Animal Crossing, Metroid Prime, and The Legend of Zelda series – all which have become gaming phenomena. Satoru Iwata was the definition of what it means to be a visionary – he believed in magic Nintendo brings to families and households around the world. He took risks in attempts to keep Nintendo’s legacy as strong as ever. For example, the sales of the Nintendo 3DS handheld console when it came out in 2011 were less than promising. Moreover in 2014, the Wii U sales also spiraled down the drain. However, what did Iwata do? He VOLUNTARILY took a 50% pay cut of his salary in 2011 and 2014 to help buffer the lack of revenue from the 3DS. WHO DOES THAT?! An amazing human being who believes in his company – that’s who. Satoru Iwata will always be remembered for his energetic, approachable, and positive attitude he portrayed whether in person, a presentation at E3, or a Nintendo Direct recording. When he came on stage or on your browser window, it always felt like you were talking to one of your gamer friends in middle school – that level of closeness I believe is characteristic of being part of the Nintendo culture. A testament to this is the massive support fans all over the world have expressed with his passing. It will only take you seconds to search “satoru iwata tribute” on a search engine and you will see countless threads and images solely dedicated to showing the love and appreciation for not only Iwata’s work, but for who he was as a person. 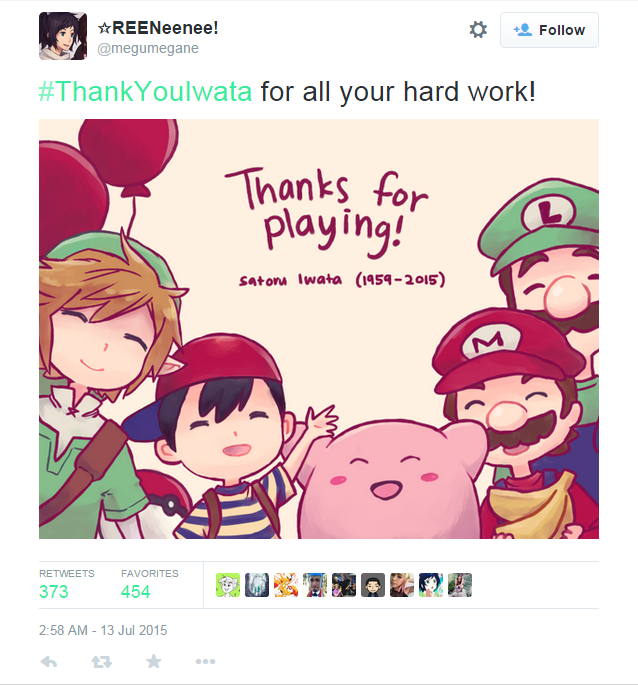 Nonetheless, Satoru Iwata, rest in peace. May your beautiful soul and exceptional work be never forgotten.